Now that you have setup your reseller storefront, you can customize your branding to create a unique experience for your customers. Continue to build trust in your community with a seamless customer experience by assigning custom colors, fonts and logos across your storefront. 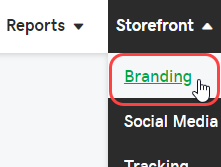 Click Storefront and then select Branding. Select a Color Palette from the drop-down menu. Select a Font Palette from the drop-down menu. Note: Visitors to your storefront will be shown a fallback font in certain markets to ensure character availability. Upload a Desktop Logo and/or a Mobile Logo to display on your storefront. Note: Desktop logos with the SVG file type are not displayed in email communications due to compatibility issues. You can customize your storefront further by using a custom domain. With your new branding, you can also create custom promotion codes for your customers.